My very first adventure with a Monarch butterfly was way back in the fall of 1982. 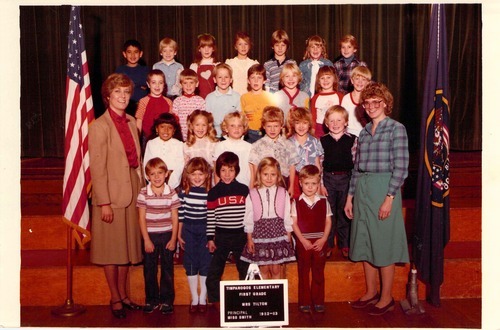 I was a first-year teacher and had just started with a first-grade class at Timpanogos Elementary School, in Provo, Utah, USA. Timpanogos was a two-story school built in 1938. The floors in the classrooms were wooden and there were no modern conveniences. 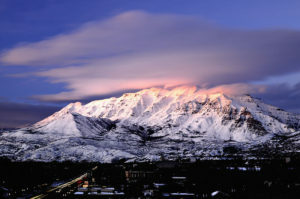 I loved that classroom, though, because large windows covered the east wall and I had a lovely view of Mount Timpanogos from my desk: verdant green in spring; the color of a hay field in summer; ablaze with yellows, reds and oranges in autumn; and snow-capped in winter. I was blessed that year with a mentor who was a seasoned teacher. To help me get ready for the arrival of my students she took me to buy teacher supplies, she shared her lesson plans with me, she helped me organize my classroom, and she brought me a Monarch (Danaus plexippus) caterpillar in a jar. I had never seen a Monarch caterpillar, and I am not sure if I had even ever seen a Monarch butterfly. I set the jar on my desk that sat next to the windows so that we both could start our new adventure together. I still remember that first day of school like it was yesterday. I made so many mistakes it is a wonder I survived! By the end of the day I realized I knew nothing about teaching. What was I thinking? I never should have taken the job. I was destined for failure! I walked into my mentor’s classroom and cried. She reassured me that I would eventually get the hang of things. Monarch caterpillar in the “J” positon, hanging by its tail and preparing to shed its skin for the last time and pupate into a chrysalis. The second day of school one of the students observed that the caterpillar had eaten all the leaves that were in the jar and it was hanging from the stem that was left over. The students were very concerned for the caterpillar because they thought it was dying. I reassured them that it was what the caterpillar had to do to become a butterfly. Each day I found myself feeling more comfortable and self-assured. The students were also getting adjusted and were settling down to the classroom routine. Everyday I could feel improvements in managing the students’ behavior. I followed the lesson plans. 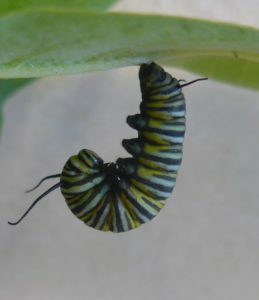 As for the caterpillar, it just continued to hang from the stem, but now as a beautiful, jade-green Monarch chrysalis. 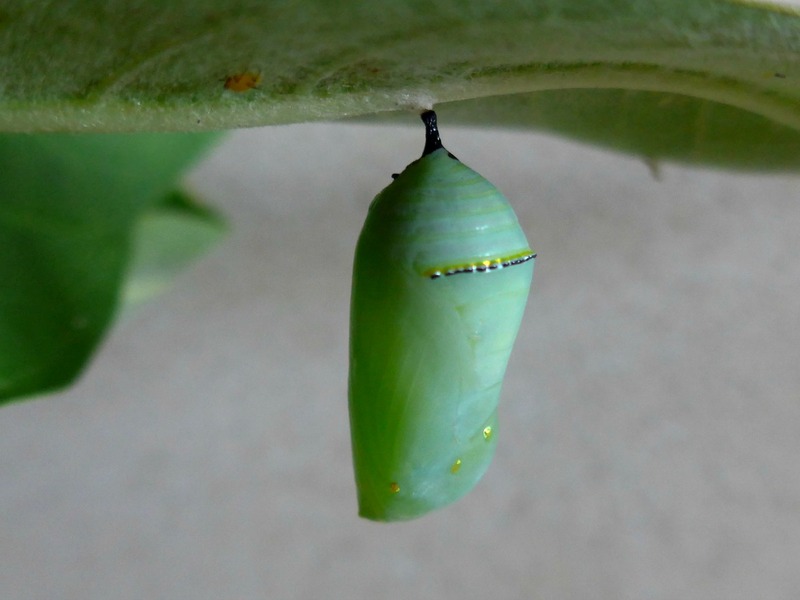 Elegant jade-green Monarch chrysalis with its gold highlights. Every morning at 10:30 we had recess, which was the favorite part of the day not only for my students, but also for me, because we loved going outside to play. There was a door in the classroom that led to the outside through which we used to leave and walk to the playground. One day, on our return to the classroom, a commotion erupted. The kids were jumping up and down and shouting excitedly, “Look Mrs. Tilton! Look!” As I walked in the room behind them I realized what all the excitement was about. A beautiful orange and black butterfly was now hanging from the stem inside the jar. I calmed the kids down and explained that the butterfly needed it to be quiet or it would be frightened by the noise. I also realized that I would never get the kids focused on the math lesson I had planned to teach that day. I gathered all the kids on the floor by my desk so we could observe the beautiful transformation that had occurred. They wanted to talk about what had just happened, so I gave every child an opportunity to discuss and ask questions. “Will it be able to fly away?” “Can we keep it?” “Where will it go?” “What will it eat?” I myself was new to this experience and did not know how to answer most of their questions. The Monarch butterfly continued to quietly hang inside the jar. 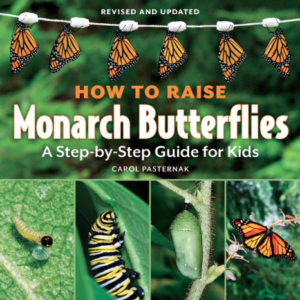 Wish that I had Carol Pasternak’s wonderful book, How to Raise Monarch Butterflies: A Step-by-Step Guide for Kids back in 1982. Click here or on the photo for book details and to order your own copy. The rest of that day we learned more about Monarch butterflies. We learned that they actually start life as an egg. We learned that Monarch caterpillars only eat Milkweed (Asclepias spp.) plants. We were amazed to find out that the Monarch butterflies were heading south to Mexico for the winter. We discovered that our Monarch was a female. We wrote a classroom story about our female Monarch and the children enjoyed drawing pictures of our beautiful butterfly. Then something magical happened. The Monarch came out of the jar and flew towards the windows. The students screamed with delight, “Look, look, look!” The children jumped from their desks and ran over to get closer to the butterfly. I walked over to the large window and pulled it down to open. We then watched that magnificent Monarch gracefully fly outside and start her southward journey. 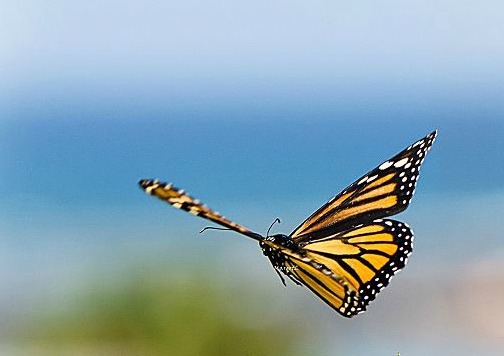 Monarch butterfly on the wing. • Photo courtesy of Margot Leandro. Copyright © 2011 by Margot Leandro. All Rights Reserved. Used with permission. That day the orange and black butterfly taught me a lesson. She taught me how to be a better teacher. I witnessed the excitement on my students’ faces as they discovered something new and experienced the joy of learning. Children need real-life experiences to be able to connect to the things they read about in books and see on the internet. They need to make connections to their world before they can write about them. I hung the pictures of their butterflies on the windows and pinned their story to the bulletin board for the parents to enjoy for our first open house. How wonderful it was to observe these kids share their learning with their parents. Many of those parents who were doubtful about this first-year teacher were now reassured that their children would learn under my tutelage, and all because of a Monarch butterfly. Looking back on that experience I realize that it was very symbolic of that first year teaching those 26 first graders. 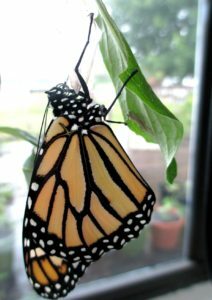 I struggled to become an effective teacher, just as the Monarch struggled out of its chrysalis. It was the start to a very long teaching career, just as it was the start for a very long journey to Mexico for the Monarch. And just as the caterpillar changed into a beautiful butterfly, my students also transformed that school year into readers and writers and began their long careers as life-long learners. 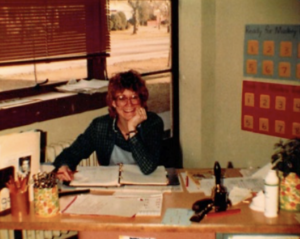 I continued to teach in public schools and after 28 years I retired and started my own business. I now raise butterflies, including Monarch butterflies. I bring my caterpillars and butterflies to classrooms and teach about the lifecycle of a butterfly. I let the kids hold and touch the caterpillars and butterflies. 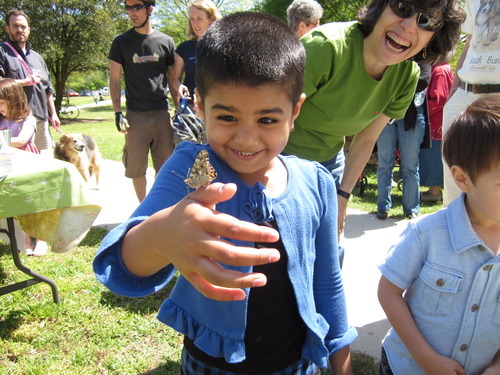 I experience over and over the delight on a child’s face when they get to hold a butterfly for the first time. 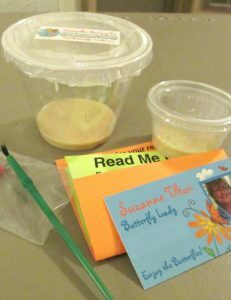 I also make low-cost Painted Lady Butterfly Caterpillar Rearing Kits that I sell so that others can experience the joy of raising and releasing a butterfly. Butterfly Lady’s Painted Lady Butterfly Caterpillar Rearing Kit. Click here to check current availability and to place your order. I love being the Butterfly Lady and owe my humble start to a Monarch caterpillar that led me on my own metamorphosis and migration.